One of the most popular types of pools being added to new and existing homes is called an “infinity pool”. 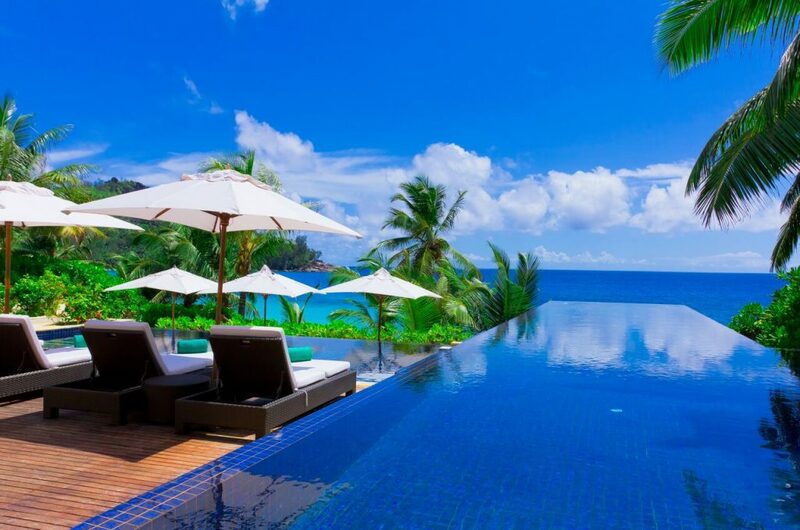 The infinity pool is a reflecting or swimming pool where the pool’s water flows over one or more of the pool’s edges. This creates a visual effect in which it looks as if they pool has no boundary. Frequently, infinity pools are built in spaces in which the edge seems to merge with a larger body of water, such as the ocean or lake, or sometimes with the sky. Because infinity pools are new and other luxurious places. But infinity pools are becoming increasingly popular among the average homeowner as well. Also known as negative edge, zero edge, disappearing edge, or vanishing edge pools, these spectacular swimming pools can add value and prestige to practically any home. Infinity pools work by dropping the water into a weir that is slightly lower than the pool’s water level. a trough or catch basin below the weir catches the water, which is then pumped back into the pool. The effect can be astonishing, especially when played against the horizon such as the empty sky or the tranquil blue ocean behind it. But before you start planning your backyard infinity pool, keep in mind that they often require extensive and architectural detailing. Typically, they are built in locations that are on the edge of a building or outcropping. So it’s critical that they have sound structural engineering. Generally, the most expensive part of an infinity pool is the intricate foundation systems that anchor them to hillsides.